Across the UK we are seeing more and more examples of smart city transformation. Key ‘smart’ sectors utilised by such Cities include transport, energy, health care, water and waste. Against the current background of economic, social, security and technological changes caused by the globalization and the integration process, cities in the UK face the challenge of combining competitiveness and sustainable urban development simultaneously. As I’m sure you know, a smart city is a place where the traditional networks and services are made more efficient with the use of digital and telecommunication technologies, for the benefit of its inhabitants and businesses. With this vision in mind, the European Union is investing in ICT research and innovation and developing policies to improve the quality of life of citizens and make cities more sustainable in view of Europe’s 2020 targets. The smart city concept goes beyond the use of ICT for better resource use and less emissions. It means smarter urban transport networks, upgraded water supply and waste disposal facilities, and more efficient ways to light and heat buildings. And it also encompasses a more interactive and responsive city administration, safer and secure public spaces. 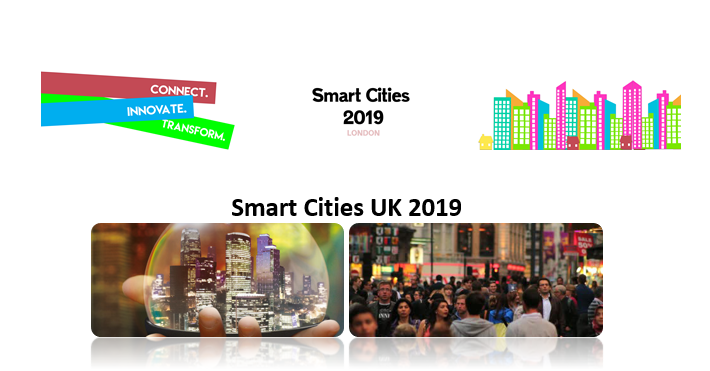 Smart Cities UK 2019 Conference, Expo and Awards will lead the way on addressing the best practice examples on smart transformation from across Cities within the United Kingdom whilst disseminating guidance and information transformation within waste, energy, transport, security and other key smart sectors. Connect with over 50 speakers and thought leaders from around the UK to discuss future visions, goals and challenges to make cities smarter and more sustainable. Find out about the latest pioneering and innovative projects via our awards which recognize initiatives that can potentially change communities across the UK.